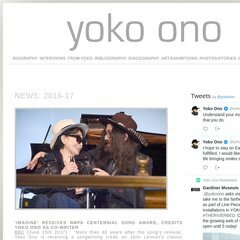 a-i-u.net aiu: a yoko ono website. wishing in yoko ono&apos;s art. a-i-u.net aiu: a yoko ono website. gerry deiter&apos;s montreal bed-in 1969 story ..
a-i-u.net aiu: a yoko ono website. instruction pieces by yoko ono. a-i-u.net aiu: a yoko ono website. a yoko ono biography. part two. The site has about 117 users daily, viewing on average 1.20 pages each. Nebula Oy. Web Hosting Pri-dns And Streaming. Its IP Number is 217.30.180.39. It is hosted by Nebula Oy. Web Hosting Pri-dns And Streaming. Helsinki, using Apache web server. Its 2 nameservers are ns2.nebula.fi, and ns.nebula.fi. PING virtual15.nebula.fi (217.30.180.39) 56(84) bytes of data. A ping to the server is timed at 144 ms, and the average page load time is 2539 milliseconds.